When you arrive at the museum, you can literally walk in history. You think you are in the textile industry of the last century. Rattling machines in a monumental factory that breathes the atmosphere of the 1930s. At the same time, there is the surprisingly modern museum presentation on textile and the textile industry in Horst and surroundings. There are stimulating exhibitions and inspiring activities for young and old such as workshops, classes and lectures. In the documentation centre you will find, in addition to comprehensive genealogical offerings, everything about the history of the region and of its textile history.you arrive at the museum, you can literally walk in history. 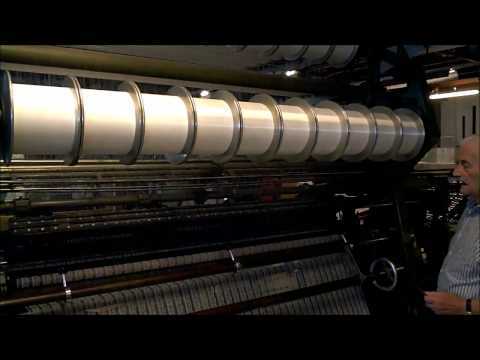 Until 2006 the almost antique lace machines were still used daily to produce more than a thousand very fine threads. A number of these machines have been preserved and you can see them in functional condition in the Museum. You smell the oil and you hear and feel the rumble of the machines. Under your eyes the lace is formed by a combination of machines, bobbins and needles at high speed and with brilliant logic. Effective mechanical magic created by people at a time when there were no high-tech gadgets and intelligent apps to support them! Museum de Kantfabriek shows that the textile industry was the beginning of the economic prosperity in the region of Northern Limburg. The soil was poor and for fertilization sheep were kept. The wool was spun and in winter it was woven. Farmers grew flax to make linen. Nowhere else in the Netherlands weaving was done at home on such a large scale. Thus a knowledge area for textile industry arose, of which we still find the tracks. Where textile industry developed, wonderful feats of textile art and industry came about. The Museum has a special collection of old and modern objects that you can view in permanent and changing exhibitions. You can see, hear, read and join in; a visit to Museum de Kantfabriek will definitely be an interesting experience!